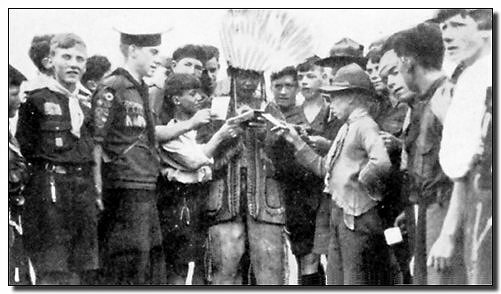 This story of the Canadian Contingent’s experiences at Arrowe Park is from Canada’s Scouts at the World Jamboree 1929, the contingent’s report to the Governor-General and Chief Scout for Canada. It traces the contingent from its first organizing steps through training, the voyage to England, travel after the Jamboree, and the voyage home. In addition to the narrative, the report includes many photos from the Jamboree and the full text of several of the most notable addresses to the Scouts. The material is courtesy of Kevin Snair of Halifax, Nova Scotia, Canada. 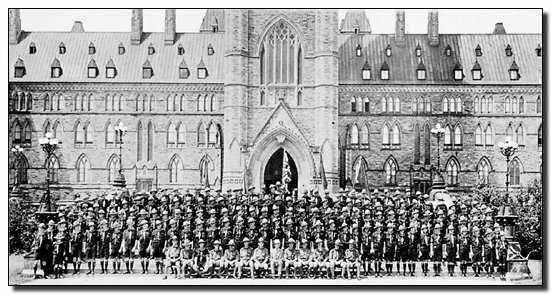 The Canadian Contingent to the World Scout Jamboree on the steps of the Parliament Buildings, Ottawa, July 16, 1929, prior to its review by the Prime Minister, the Rt. Hon. William McKenzie King. Seated in the centre, Dr. James W. Robertson, our late beloved Chief Commissioner, who spent several hours each day with the Contingent in the training camp. The Antonia docked at Liverpool early Sunday morning July 8th. Notwithstanding the early hour and a drizzling rain, the Contingent received a rousing welcome. One of the first greetings was from our old friend "Pickle” (Sir Alfred Pickford), the Oversea Commissioner, who came hurrying down the landing stage with Lord Hampton and others. After Pickie had helped clear the Contingent through Customs they went aboard a tender specially provided for the purpose, and were carried across the harbour to Birkenhead. In perfect order the four Troops filed ashore, and passed through the dock gates. Marching in half patrols (fours) in yellow slickers, packs on backs and staves slung at the shoulder, the long column made a striking picture as it marched up the hill. Around the corner at the top of the hill were four big double-deck buses, and on their sides the mystic name "ARROWE PARK." The signs were greeted with a cheer; and in a few minutes the four troops were aboard, and off, singing through the streets of Birkenhead, on the last lap of the long journey to the great Jamboree. The continuing rain in no way dampened the enthusiasm of the arrival at the gate way of Arrowe Park itself, and the march up the long avenue of old trees, past Arrowe Hall. The first realization of the extent of the Jamboree camp came as the column left the road and proceeded across field, passing section after section lined off with stakes and ropes. Most of these sections were still empty; others contained the tents of advance parties One of these passed, and the first with which the Canadians exchanged a greeting, was a camp of East Indian Scouts squatting around their fire. The Canadian greeting was returned with a broad smile and a waving of hands. Another half mile tramp brought Cat Lane, and the Canadian Camp. Thanks to the good work of Quartermaster Edgar Jones, our "advance man," all the tents were up. They had been erected practically as located by plan in Ottawa. The four Troops at once took possession of their allotted sections, and in a few minutes the patrols were busy making themselves at home. It was now after 2 p.m., the boys had had nothing to eat since 6.30 in the morning and it was still raining. However, there was no suggestion of grumbling when the Patrol Leaders appointed cooks and cookees to procure wood, make fires and prepare the dinner. Scoutmaster Lemmon of Toronto was placed in charge of kitchens, the fireplaces were lined up, and soon twenty fires were burning in an orderly row along the woods which marked the southern boundary of the Camp. Being early, the Canadians had an opportunity of lending a hand to later arriving contingents. The first of these neighbors, the Londoners, came in a few hours after. Rain was still falling and at once our boys went over to offer hot drinks, assist in raising tents, etc. On subsequent days they similarly gave the Sussex a hand with their tents, and supplied the late arriving Norwegians with dixies of boiling water for supper coffee and cocoa. The Canadian Contingent formed part of Sub Camp 2, under Lord Glentanar. as Camp Chief, and the Chief Commissioner for Scotland, Mr. W. L. Calderwood. The other contingents composing the camp included the Scotch, Sussex, Norwegians, Hungarians, English Public Schools, Kenya Colony, British Foreign (representatives of British Troops in foreign lands, such as Gibraltar, Paris, etc. ), Jersey Island, Bristol and Northants. In all a little under 3,000. While not one of the largest, it undoubtedly was one of the lively, colourful camps of the Jamboree. The Hungarians, numbering 800 and wearing a flowing brown cape and a white plume in their hats, had with them two excellent bands, one of which was usually playing sprightly music, without regard to weather. The Scots, all in kilts, were a lively addition to the camps, and the rollicking skirl of their pipes was frequently heard. The splendid tall blond Norwegians, in their blue-grey uniforms, added their touch of colour; the East Indians from Kenya in their turbans; the Sussex Sea Scouts, the varied troop uniforms of the others, and the green and yellow sweatered Canadians. The London Times referred to the Canadian sweaters as "green and yellow jumpers." Patrol Leader Bob Grey of the Wolf Patrol of the Byngs, and son of the Chief of the Wolf Tribe of the Tsimpshean Indians of British Columbia, soon had writer’s cramp. (He was made Patrol Leader of the Byng Wolves purely by chance). The opening days in the Canadian Camp were given up chiefly to display rehearsals, and try-outs at the Arena. It had been hoped that at least one of our Display features would be accepted, and given a place on the programme for the opening Jay. Imagine our delight, however, when we were told that Canada had been awarded no less than four of the main spaces immediately in front of the royal box. The success of the Arena displays by our Scouts was not due to chance, but to consistent practice carried out at Ottawa, aboard ship, and in camp; and to the elaborate care given on each occasion to make-up. In camp the difficulty of this was added to by the continuous rain. Finally there came so many requests from the arena, theatre and sub-camp council fires that it was necessary to cancel all engagements for several days, not only to rest the boys physically, but to save their skins, which were showing the effect of frequent greasing and painting. A great many pictures were taken and on one day our Scouts had to rehearse before press photographers no less than eight times. Pictures of the Canadians appeared in dozens of Old Country dailies and weeklies and also in the movies. The Canadian Scouts threw themselves with a will into the tasks ahead of them. One day during the latter part of the second week an urgent call came from the main theatre for the Canadian Indian dances. Unfortunately more than half of our boys who were taking the parts of Indians off on excursions. The remaining Scouts in the display were not to be beaten, however, and securing raw recruits they practiced almost ceaselessly for five hours. That evening they found they formed the entire programme in the main theatre. Time did not hang heavily on the hands of anyone in the Canadian Camp. There was work to do, and lots of it for any person who would lend a hand. It was frequently raining when the cooks were roused at 6.30 to begin their struggles to get the fires going. The rest of the camp rolled out at 7.00 and breakfast was at 8.00. There was no set time for flag break and prayers because of the fickle weather. The midday meal was generally at one o’clock and supper between six and seven. During rainy days the Scouts seized opportunities between showers to air their blankets. If they could not spread them out on the ground sheets, they would take them out one by one, give them a thorough shaking, fold and put them back. There were difficulties at all times with the wood; it was either short in quantity or the quality poor and damp. At one time the Canadians bought a crosscut saw and were given permission to cut some oak logs which were lying in the nearby copse, but the wood was exceedingly hard to split. At the end of the first week the Scouts were given permission to build houses over their fires. This they were able to do by means of their spare ground sheets and some lumber which was bought at Birkenhead. Thereafter the line of 20 huts in the Canadian Camp attracted considerable attention, no two being alike. Prizes were given for the best constructed huts. Every morning after flag break Mr. Walter Lemmon took the cooks aside and with the day’s menu in his hand gave them instructions regarding the preparation of the day’s meals. All the officers dined with their troops and had to eat the food set before them by the Scout cooks of the day. Some of the cooks did exceptionally well and others not quite cm so well, but it was splendid that they were able to carry on with patrol cooking under the adverse circumstances. Our Scouts might have been more comfortable if we had furnished them with a paid cook, but we felt we owed a duty to the Scout camps back home to see that they did their best to use the Patrol System in its entirety. The food supplied by Headquarters was good but from our point of view it was short on milk, butter and sugar and long on canned and other meats. However, by availing himself of exchange privileges and by purchasing small quantities outside camp the Quarter’ master did very well. Twenty-five hop poles were purchased from a local contractor and used for building an attractive entrance to our camp, and in constructing the Scout huts over the fires. Two faithful Scouts carved a couple of bears to be placed one on either side of the Canadian gate. The troops took turns in assigning Scouts and officers to stand guard at night, a task which was not always easy in the darkness and rain. Once or twice some of our boys turned out to help Scouts in other camps when tents were blown down. A large lettered sign, "CANADA," which we had erected at the end of Kingsway, indicated our location to visitors, and within the camp another sign drew attention to our Display Tent. The Display Tent was a large marquee and contained two long bunting draped tables on either side. On one of these was displayed Canadian Scout publications to be sold, on the other free literature. The latter included the book supplied us by the Department of Immigration and Colonization in Ottawa, entitled "Canada, The Land We Come From." This was very popular and by the end of the first ten days the supply was completely exhausted. It was soon evident that the people who were coming to the Display Tent, came not only to see the Scout things on display, but also to get other information about Canada. An arrangement was therefore made with the Canadian Government’s agents in Liverpool whereby they assisted in decorating our Display Tent with samples different kinds of grain and fruit and pictures illustrating life in Canada. These, together with our books, photographs of our Contingent and with Scouts making baskets, carving, etc., made a very effective display which drew large crowds. Of the things sold the best sellers were our Scout Diary and Canadian Scout Handbook. Scouts and officers faithfully took turns attending to the Display Tent, many times we are sure when they would much rather have been going down through the Jamboree Camp to see the sights. The Commissioner-in-Charge remarked that he did not think there was a Scout in our camp, especially among those who served counter in the Display Tent, who did not wish he had paid more attention to his French when at High School, or who did not make up his mind to concentrate on French on returning to his Collegiate. However, they used what French they had to good advantage and by means of signs and English words were able in about every instance to make the visitor understand. Because our Canadian boys were big and strong they were frequently called upon to do things which smaller Scouts from other countries could not do. They were asked to supply big boys to issue passes at the gates or to act as ushers. Sub-Camp Chief Lord Glentanar one day requested Canada to let him have some big Scouts for wood dump duty, and on August 12th, we supplied an all-night baggage dump guard—no easy task towards the end of the Jamboree when everyone was tired. On one or two occasions a "fatigue party” of big Scouts was furnished to act as road builders and mud scrapers. Each day orderlies were sent to Sub Camp Headquarters and to the General Information Tent at the main gate. All of these tasks and more were accepted cheerfully by the Canadian Scouts. Each morning we had an inspection visit from Sub-Camp Chief Lord Glentanar or a member of his staff and every morning except Sunday either Mr. Stiles or Mr. Coombs attended a Commissioners’ Conference at Sub-Camp Headquarters at which Lord Glentanar presided. Apparently everything was well organized and the Canadian Scouts were soon proud of Sub Camp Two. Mr. Stiles reports he never had cause to regret the manner in which the Scouts from Canada were equipped. The slickers especially were useful, be cause of the frequent rain; and when not worn the Scouts carried them in their haversacks. The coat’ sweaters were worn almost constantly. It was noticeable that many Scouts from other countries were not as well protected against the weather. On several occasions during the big reviews, and notably during the great service in the arena on Sunday, August 4th, when clear spells were suddenly followed by drenching downpours, our Scouts were speedily in their raincoats, while many of the other contingents stood and took a drenching. The greatest problem for our boys was finding an opportunity to wash their clothes. They were able to do this only twice during the whole Jamboree and the Post Jamboree Tour. However, the Scouts did a good deal of washing themselves. During the morning of the 31st July the Duke of Connaught arrived at Arrowe Hall and was received by the Chief Scout and members of his staff. The Canadians were asked to provide a posse of welcome, and the Connaught Troop was accorded that honour. The Troop, in charge of Commissioner Stiles, met the Duke at the Hall, and was there inspected by His Highness. The London Times said it was appropriate that the Canadians should form the Guard of Honour for the Duke. The Canadians break ranks for a rest during the wait before the great march past. Note the haversacks slung over backs. They contained the yellow slickers which so frequently blossomed out under the rain. In the afternoon the Duke of Connaught, as President of The Boy Scouts Association, standing in the Royal box at the Arena, declared the Jamboree open. After the great cheering had died down at the conclusion of the Duke’s address, an all embracing solemnity seemed to fall upon everyone and there was silence. Presently the music of a composite band set the first contingent moving and the Scouts of the United States headed the March Past. Pipe and drum took turn and turn again with the band and the great parade continued. The Commissioner in Charge and those who were with him will never forget the emotional excitement of the occasion, as the Scouts from 42 nations and 31 parts of the British Empire, keeping time to the music of the band, marched 25 abreast around the field and past the saluting base. The cheering of the various groups as we passed them was spontaneous and vigorous. Many of the Scouts and their leaders and those on the grand’ stands confessed afterwards that they were choked with emotion at the sight of the foreign troop flags and the thousands and thousands of Scouts of all nations as they tramped, tramped, tramped past for nearly an hour, looking proudly ahead and all remembering that they were Scouts who had promised to do their duty to God and their Country and to help other people at all times. The idea that these were peace Scouts seemed to grip everyone. To those who had endured the horrors of war at home or in the field, this vast, youthful army of peace and hope was a sight never to be forgotten. 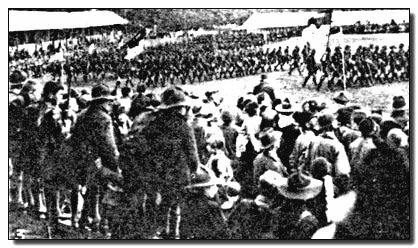 The start of the first great historic march past of the Scout youth of the world. In his address the Duke said, "I am thrilled at the spectacle before me, and as President of The Boy Scouts Association I am indeed glad to he here. If I asked myself the question ‘What does the future hold for our countries and for Humanity?’ I read in your faces the hope and promise for a better world, and in the light of your eyes is the dawn of a better day." The Seattle Times referring to the march past, said, "Old man Mars, sunning himself on his front porch, may well look upon this Jamboree with high disfavour." 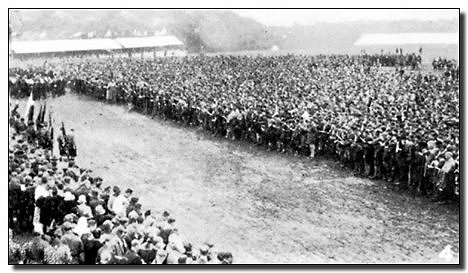 After the great march past there massed for folk dancing no less than 1,500 British Scouts, a spectacle not easily forgotten. A cheer by Scouts of all the world for a most popular brother Scout — the Prince of Wales. The Prince of Wales arrived at Arrowe Park the afternoon of August 1st travelling by aeroplane. After he had gone to his tent, where he was to spend the night, and had changed into Scout clothes he was greeted on the lawn at Arrowe Hall by 200 representative Scout officers from 35 different Nations. The next morning he delighted our hearts by visiting the Canadian camp. With a Rover Guard of Honour he came through in friendly, informal Scout manner, shaking hands and speaking with a number of us. A Scout from Calgary had the honour of handing him a letter from Dr. Carlisle, manager of the Prince’s ranch in Alberta, and some Scouts from Windsor, Ontario, presented him with an illuminated address from the Rotary Club of that city. In the afternoon the Prince attended the Pageant of Nations held in his honour, and carried a message to Sir Robert Baden-Powell from his father, the King, that he had conferred upon him the dignity of a Barony of the United Kingdom. Lord Baden-Powell visited our Camp several times, as also did Sir Alfred Pickford, Lord Hampton and Mr. Hubert Martin. Mrs. Warren, Chief Commissioner for the Canadian Girl Guides, called several times and offered to do anything she could to help. Several officers of departments of the Canadian Government in England called and offered assistance. One day a delegation from the Australian Contingent came to present the Scouts from Fort William with a Kangaroo skin. This was in return for a Wolf skin sent them by the Fort William Scouts some time previously. Late one afternoon in the rain four or five English Public School Scouts, who had lost their way, wandered into our camp. One of them turned out to be Peter Baden-Powell, son of the Chief Scout. During the first week the Canadian Camp did not have as many visitors as some of the other camps, but by the second week the general public had found us, and in the afternoons there was an endless stream of callers. Many came to meet Scouts who were relatives or sons of friends in Canada. Some of the questions asked by visitors who knew little about Canada were rather amusing: "Don’t the furs you wear in the winter make you feel very itchy?" "Do you have much trouble with the Indians living around Halifax?" One visitor wanted to know why we were not wearing our moccasins and if we found the heat of England hard to bear. Another man wanted to know what protection Mr. Jones of Toronto carried against wolves and bears during his field work. A Scout from Johannesburg, South Africa, wanted to know if we had snow all the year round and if Toronto was bounded by a huge forest. Scouts in the East were frequently asked if they knew Scouts living on the prairies, etc. One evening two or three Scotch Scouts came into camp and on invitation began to teach some of our boys to dance. Our boys became interested and the Scotch lads volunteered to return the next evening and bring their bagpipes. This they did and a lively evening of Scotch dancing resulted, with Scouts from other camps participating. One eightsome reel included Norwegian, French, German and English Scouts, in addition to Scotch and Canadians. Our own Doctor was noticed dancing and throwing himself into it with energy. He seemed to realize that he was helping to make history for the Jamboree. The next day, August 3rd, the Commissioner in Charge gave special leave to most of the Scouts in the Canadian camp. The boys had been camping under difficulties; the display groups had been working hard, and it was time they all had a rest. Therefore, out of the fund provided by Mrs. T. Carleton Coffin, of Ottawa, each Scout was given 1s 6d and told he might go to Liverpool for the day. It was evidently a welcome break for the boys. 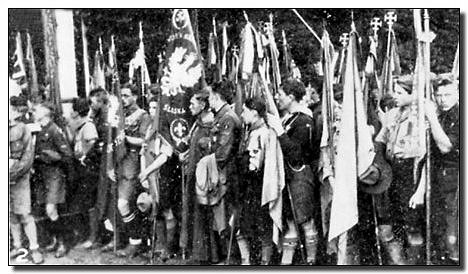 August 3rd was the occasion of the great Wolf Cub rally at Arrowe Park, in which some four thousand boys took part, and the Sea Scout display at West Kirby. Both were remarkable exhibitions, but unfortunately the Sea Scout show had to be curtailed owing to a stiff gale. A section of the massed thousands who attended the great Protestant Thanksgiving Service of August 4th, conducted by the Archbishop of Canterbury. The Sunday services of August 4th will long be remembered by those who took part—the massed thousands, the singing, the impressive addresses of the Archbishop of Canterbury and Archbishop Bourne before the Protestant and Catholic assemblies. Undoubtedly never before had boys of so many tongues raised their voices in unison in praise of their Maker. At the great thanksgiving service in the morning at the Arena the Archbishop of Canterbury during his address turned to Baden-Powell and laying his hand upon his head in blessing said, "The Lord is with thee, thou mighty man of valour." The packed service in Liverpool Cathedral was another memorable Sunday experience for those who were able to attend. A few of the standard bearers of many nations represented among the 10,000 Roman Catholic Scouts and leaders at the memorable service conducted by Cardinal Bourne, Archbishop of Westminster, on August 4th. At noon on August 5th the Commissioner, with a party of Scouts, paraded on the lawn at Arrowe Hall, and the Chief Scout after a characteristically happy speech stated that he wanted to offer each Dominion a totem pole as a memento of the Jamboree. It was only a small thing, he said, but it was a little piece of old English oak to carry back home with them. During the winter storms of the year some branches had been blown down in his village and several pieces had been saved for carving. The tree from which Canada’s totem pole was made was at least twelve hundred years old. Each totem pole was designed and carved by Mr. Potter of Gilwell Park. The Commissioner-in-Charge of the Canadian Contingent went forward, with Scoutmaster Power of Nova Scotia, to receive Canada’s totem. The Chief Scout, after the presentation, beckoned to Mr. Stiles and said he wished to give him a cane made from a piece of oak from Westminster Hall. From the standpoint of the general public, undoubtedly August lath, Bank Holiday, was the high spot in the whole Jamboree. The sun came out and everyone was smiling. In spite of the sticky mud everywhere on the Jamboree grounds, 40,000 people poured in from all points of the compass. Cars, buses, motorcycles, bicycles, queues of people a mile long—all contributed to make the holiday a record at Arrowe Park. The spirit of Scouting seemed to get into the hearts of everyone. Every where were happy faces and cheerful sounds, not’ withstanding spoiled boots and ruined stockings— the public had come to see the Scouts of all the world. Undoubtedly the wonderful parade of nations was the unfailing magnet, and in addition there was the Joan-of Arc Pageant staged by the French Scouts, not to mention the lengthy list of other displays on the programme. The British public took all the Scouts to their hearts and applauded heartily every group as it swung past the saluting base. In all there were 42 Nations and 31 different parts of the British Empire present making a total of 73 different national units in the parade. Our contingent had the honour of leading the march past on this big day. On Tuesday, the 6th of August, the Commissioner-in-Charge took the Devonshire Troop from Arrowe Park to Chatsworth where they received a royal welcome from the Duke and Duchess of Devonshire and the members of their family. The Duchess personally acted as a guide, taking them through the house and around the grounds. The Duke himself, as much as he could, accompanied the troop everywhere. It was quite evident that he was glad to see the Canadian Scouts and delighted to watch the boys wandering up and down the paths and among the wonderful trees on his estate. This was also the day on which the various contingents began their organized visits to places of interest by bus and train. Such excursions by the contingent, in whole or part, included the Liverpool and Birkenhead Docks, Port Sunlight, Chester, Bolton, Brighton, and Manchester. Small parties visited Tatton Park, the home of Lord Egerton (owner of a B.C. ranch), Torquay and Plymouth. The principal trips were made jointly with other Sub-Camp Two contingents—one day with the Norwegians, another with the Hungarians and another with the Scots. The Scouts were every’ where received with great hospitality; in some cases, as at Bolton, with bands and processions. Also during the second week of the Jamboree numbers of the Canadians, with the permission of parents, were granted leave to visit friends and relatives in various parts of England and Scotland. Others made trips to the continent. from the pennies contributed by no less than 1,250,000 Scouts of almost every nationality. Baden Powell replied that he was receiving far too many personal gifts and too many thanks, that the real thanks should go to those people who did the work. As for himself he had only suggested the idea upon which other people had built. 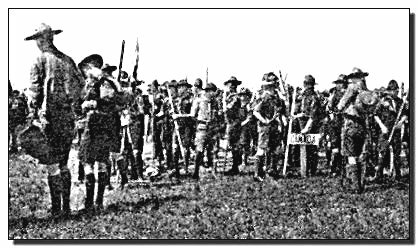 At noon August 11th on the lawn at Arrowe Hall, the Chief Scout, accompanied by Sir Alfred Pickford, Lord Hampton and others, presented six cenotaph flags to the contingents from Australia, New Zealand, South Africa, India, Newfoundland, and Canada. In the early afternoon a massed Scouts’ Own service was held on the rally grounds followed by a great service in Liverpool Cathedral at three o’clock. But Monday, August 12th was the great day of days, when the Jamboree came to an end with one of the most moving and memorable farewells in the history of Scouting. In brilliant sunshine before thousands of visitors, the boys staged a variety of displays and pageants, full of interest and thrills, but the spirit of gaiety which sustained them was tinged with regret. They knew it was time to leave and that they had to say goodbye to the man who had opened the gates of this high adventure to them. After the displays came the farewell march past the Chief, with all the contingents in each sub camp intermingling marching 25 abreast with the national flags at the head of each great column, forming a gorgeous medley of colours. 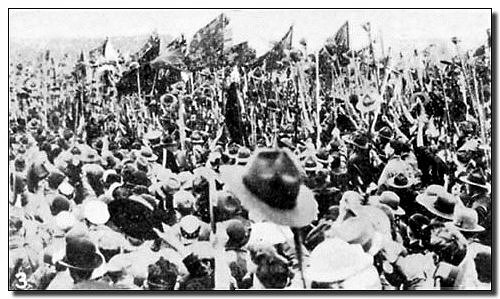 It was a wonderful demonstration of the way in which the Jamboree had brought the nations together, for boys of every creed, colour and clime marched arm in am, with hats on staves cheering wildly, as they swung past the rostrum from which the Chief took the salute. Later willing hands conveyed the rostrum to the centre if the Arena, where it formed the hub of the great Jamboree Wheel-of-Friendship, a wheel of 21 spokes, formed by the legions of youth. From the Royal Box, Scout staves fenced off a pathway along which the Chief Scout walked to the hub of the wheel. There he mounted the rostrum and surveyed the assembly of Scouts, prior to performing an act of symbolism, the memory of which will live as long as Scouting exists. "Here is the hatchet of war, of enmity, of bad feeling, which I now bury in Arrowe," shouted the Chief Scout, at the same time amidst a storm of cheers burying a hatchet in a cask of gilded wooden arrows. ”From all corners of the world you came to the call of brotherhood and to Arrowe. Now I send you forth to your homelands bearing the sign of peace, good-will and fellowship to all your fellow’ men. From now on in Scouting the symbol of peace and goodwill is a golden arrow. Carry that arrow on and on, so that all may know of the brotherhood of men. The Chief Scout then proceeded to send four Golden Arrows north, south, east and west. Swiftly these arrows of peace sped down the spokes of the great wheel and the Scouts of the various nations were clasping hands. Again the Chief shouted, "I want you all to go back from here to your countries in different parts of the world with a new idea in your minds of having brothers in every country . . . Go forth from here as ambassadors of goodwill and friendship. Everyone of you Scouts, no matter how young or small, can spread a good word about this country and those whom you have met here. Try to make yourselves better Scouts than ever; try to help other boys, especially the poorer boys, to be happy, healthy, and helpful citizens like yourselves. And now, farewell, goodbye, God Bless you all."